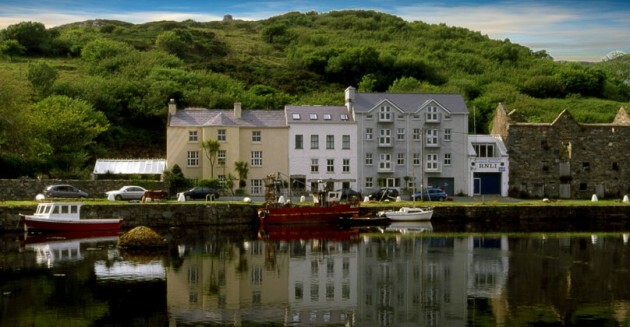 The Quay House is Clifden’s oldest building, dating from c.1820. It was originally the harbourmaster’s house but later became a Franciscan monastery, then a convent and finally a Hotel owned by the Pye family. It is now run as a town house by the Foyle family, whose forebears have been entertaining guests in Connemara for nearly a century. The Quay House stands right on the harbour, just 7 minutes walk from the town centre. 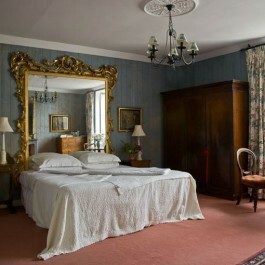 All rooms are individually furnished with some good antiques and original paintings; several have working fireplaces and all but two overlook the harbour. All have large bathrooms with tubs and showers and there are also two ground floor rooms for wheelchair users. Paddy and Julia are always on hand for advice on local activities, which include fishing, horse riding, golfing and hiking. Connemara – The western wonderland of Europe where rugged mountains soar above wild Atlantic beaches. Here there is a peace no longer found in the populated areas of our continent, and a purity so refreshing in contrast to the pollution of our cities. 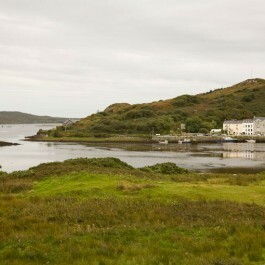 July and August are the peak holiday months when Clifden is bustling with a cosmopolitan atmosphere. Music and singing can be heard in every bar. The sea is warmer and the long sandy beaches are paradise. Autumn is the season of changing colours when the turf bogs turn auburn, the heather mingles with the gorse and the sunsets are magnificent.